Does anybody else keep an informal listing of all the Airlines & Airliner types flown on ? It will take me about a day to compile. Posted: Sat Aug 04, 2007 12:23 am Post subject: heres my list. Thanks for reviving this thread. I find it pretty interesting to know what others fly (airlines & aircraft). I've updated my list above too. Himmat and Xterra: TG does not have A330-200s only 330-300 series. Himmat CO has never operated the 737-400 series. I have made the corrections. Hi 777.FM! 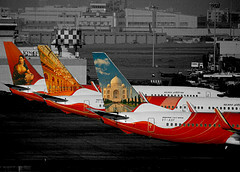 Welcome to airliners-india.net. If you wish please introduce yourself at the members introduction thread. Flying High.... You and Me...! Possibly a 727-200 as well but I don't remember. You will never Fly Alone! Also, according to EK's corporate newsletter, EK's inaugural A380 flight will be on August 1st, I am scheduled to fly DXB-JFK on 17-August (EK 201) so I might be lucky. My list...Even more smaller than the smallest above! some ATR sized aircraft 60-70 ppl could be seated. Damania operated the 732. They never did have any Dorniers in their fleet. This is Nalini's final list for those of you wanted to know, she had saved it in her computer. Guess what......Just called my sister......she was an FA with Damania back then, & she backs up your story. Seems there indeed was a Damania turboprop that flew BOM-PNQ, though she is not sure if it was a Dornier. She says she didn't fly on those 'cause "they needed to use short girls on those planes, & it had only 1 FA"!! Yes clearly only 1 FA I do remember that, heck even checked-in baggages were right behind the last seat. But then that FA was nice, she served "snacks" on that short 30 min leg and some soft drinks. Oh another addition to that is also East west airlines, again it was some exotic aircraft, some 60 -70 people could fit in and the aircraft was in a 2-2 configuration.